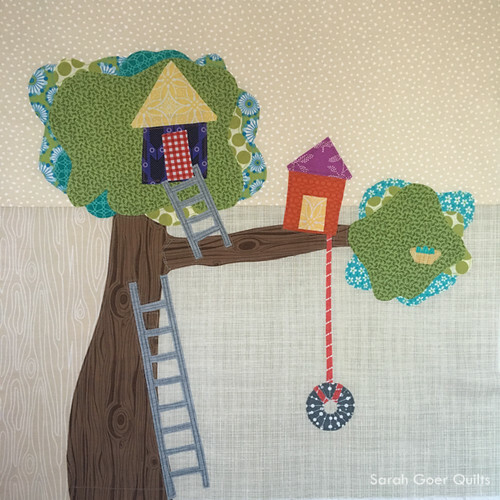 We're halfway into the Kids Quilt Round Robin, which I'm hosting with Sarah of Berry Barn Designs. We sent off R's animal block to Z and G's sports block to Caitlyn on June 1st. And shortly thereafter R and G received the blocks that they would be adding to in round 2. 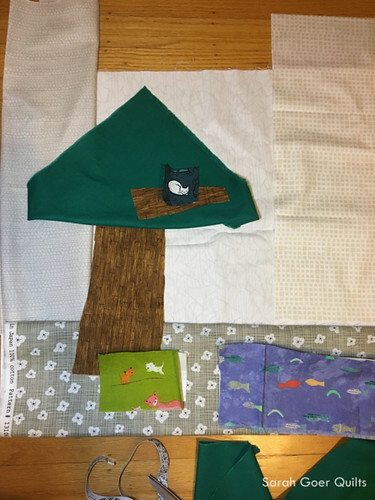 R received this adorable treehouse block from A & C (Sarah's kids, ages 8 and 6), sisters who are working together to make their little brother a quilt. 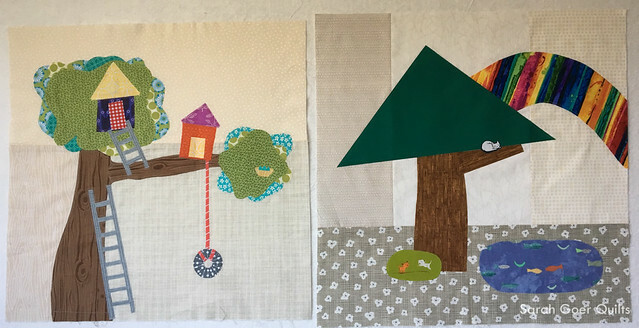 The girls asked for blocks featuring tree houses, outdoor play, or trees. In planning the block she would create, R initially drew a tree house identical to the one on the first block. 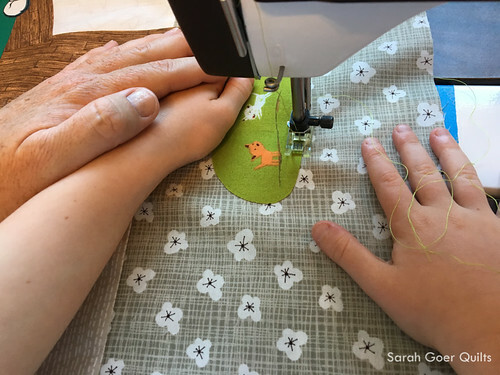 It's a fine balance sewing with kids... giving them creative control, but also helping to guide them. 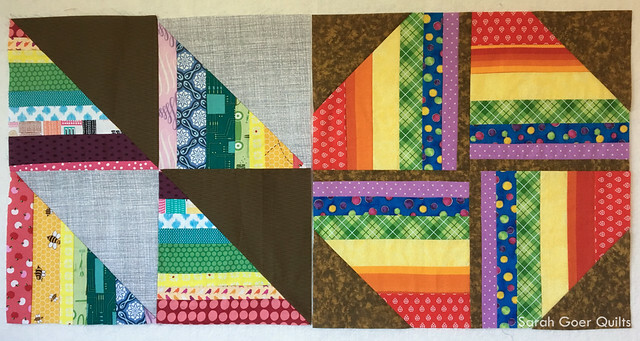 Eventually she made some decisions to personalize her block through picking fabrics from her (and my) stash. 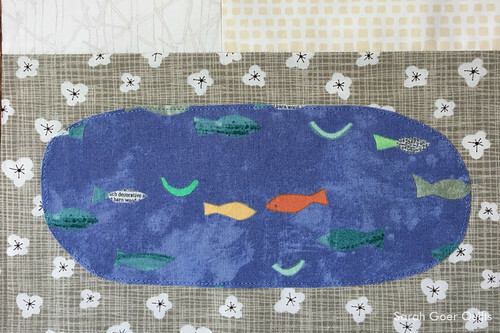 She mentioned wanting to add a pond and I offered my fish fabric. 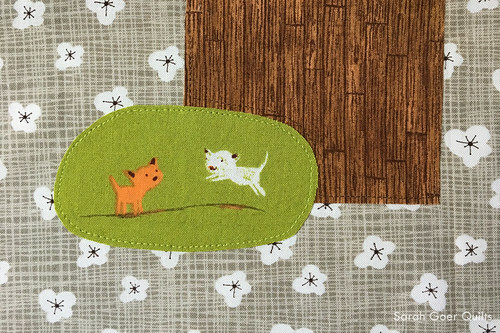 From their notes she knew that A & C have cats, so R wanted to use some of her cat fabrics. (I did manage to dissuade her from using the 6" tall sushi cats.) 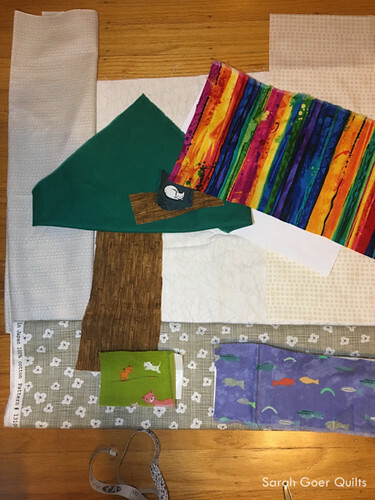 R chose two cat prints and picked two playful kittens for the area near the base of the tree and a sleeping cat to put up in the tree. We worked on the "design floor" to layout the quilt block. The final addition was to add a rainbow. I think this was a great solution to the empty space in that section of the block. R chose all her fabrics and helped me iron to prepare the fabric. We used Heat n' Bond Lite fusible. I ironed it on and trimmed the fabric per R's specifications and she peeled off the backing paper. Then we worked together to press the fabrics in place. She chose all the thread colors. 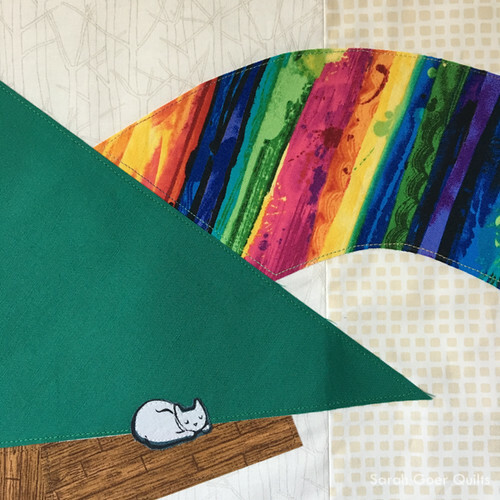 I especially like her choice of the Aurifil Marrakesh variegated thread for stitching on the rainbow. :-) R sat on my lap and "steered" while I worked the pedal of the sewing machine. G received a lovely rainbow block from Hannah (age 5). (Who doesn't love a rainbow!?) 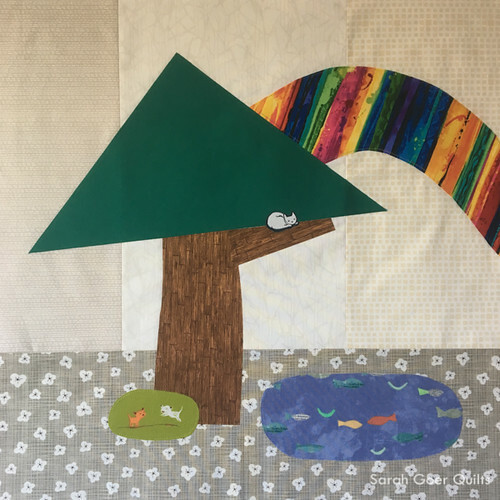 She chose a theme of rainbow stripes for her quilt and indicated that brown is her favorite color. G quickly and easily pulled fabrics for his block. 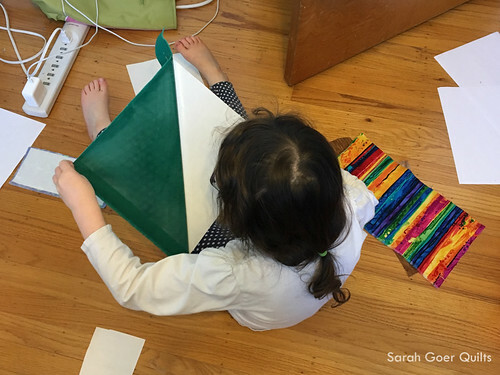 Since his "rainbow plus brown" included seven colors, and the sections he was making finish at 10" squares, I suggested he not try to have equal width stripes. He worked out the math and provided me a cutting list. I opted for cutting a little larger... I cut all the strips 11" long instead of 10 1/2" and cut the end strips (red and brown) 1/4" wider than they needed to be. This way we had some wiggle room to not end up short on the overall block. I trimmed down each unit before he put the last four sections together for the final block. He used the design wall to keep himself organized as he worked. G did all his piecing independently, with a minimum of seam ripping. He's working on accurately pinning which really helped him keep the fabrics lined up. Just three pins on the 11" strips seemed to be right. 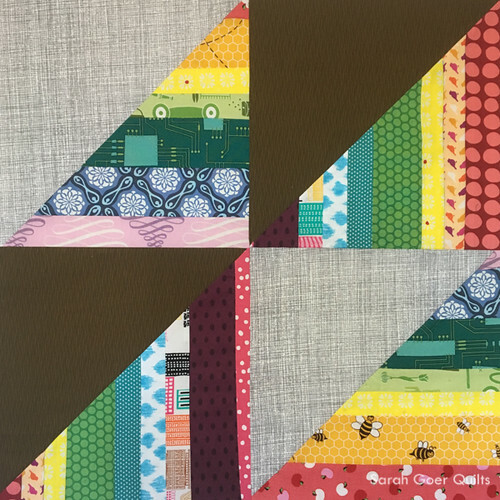 I love the addition of the brown triangles on the corners as it gives the block a pinwheel vibe. Posted in Quilting. 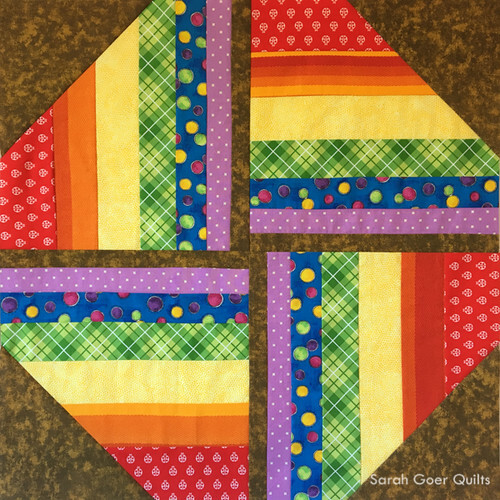 Tags: KQRR, quilting with kids on July 12, 2017 by sarah. 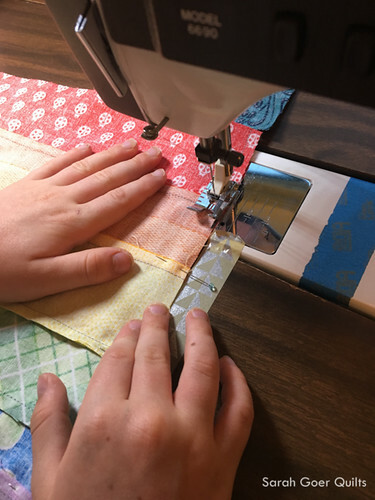 The progress is so fun to watch: the fabrics that R & G chose are both so well matched for their recipients. I can only imagine how delicate a balance it must be to guide and not over-instruct, but it seems you are all enjoying the process so far. 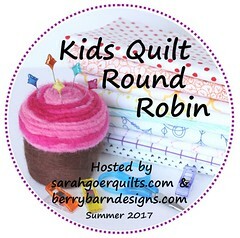 They both created some really fun additions to these round robins! Can't wait for the next round of designs!! Thank you, Mel. The packages have both arrived. Not sure when the kids will be getting to work on the next blocks.